The dataloggers F412 and F812 have been designed for monitoring physical values where energy consumption and battery life is critical. Accurate monitoring of flow meters and water flow/consumption during short time intervals. Small low cost monitoring stations for environmental parameters, meteorological data, water level, water flow and other parameters. Areas where vandalism or theft prevents using solar panels. Acquisition situations requiring flexibility and control of external devices or sensors by the datalogger. Applications requiring recurrent remote download by modem or radio-modem. The datalogger can be employed outdoor and indoor. The 12-bit resolution guarantees a resolution 16 times higher than 8-bit products commercialised by competition, making the use of Geosignal dataloggers ideal for detailed acquisition. USB / RS232 cables for PC connection. Unit Meteo 4 for micro clima monitoring. External connection board for easy wiring. Relay output: 200 mA to switch external equipment on at sampling time. Digital filter: excludable for fast data acquisition. Trigger input: sampling can be trigged by an external event or signal. Sampling interval: programmable at any rate from 1 to days. Power supply: 2 x AAA 1.5V alkaline batteries or external 3-5V. 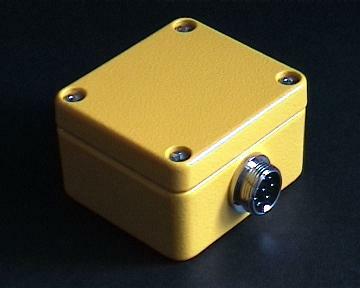 Sensors can be powered by the datalogger. Connectivity: USB, or serial cables are available. 12 internal registers for storing further data. Datalogger retains stored data when its battery is removed. Digital outputs: 4 TTL outputs. Internal date and time clock in DOS/UNIX format. Power supply: 3V lithium or alkaline batteries or external 3-5V. Connectivity: USB, or serial cables are available..
Datalogger retains stored data even when battery is removed.